Every aspect of the hotel’s furniture, lighting, colors and fabrics, has been thoughtfully renovated to offer vibrant and collaborative spaces. 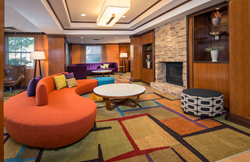 Every aspect of the Fairfield Inn and Suites...from furniture and lighting to colors and fabrics, has been thoughtfully renovated to offer vibrant and collaborative spaces. Neel Desai, Managing Principal of LTD Hospitality Group is pleased to announce that LTD has completed a major renovation for the Fairfield Inn and Suites in Williamsburg, VA.
LTD completed the implementation of Marriott’s Perspective Design Package for the 149 room Fairfield Inn and Suites by Marriott Williamsburg, VA located at 1402 Richmond Road in Williamsburg, VA.
Every aspect of the Fairfield Inn and Suites owned by Devi Holding Company, LLC, from furniture and lighting to colors and fabrics, has been thoughtfully renovated to offer vibrant and collaborative spaces. The recharged lobby-featuring upbeat colors, accent fabrics, new carpet, new check in pods, updated business center, and stained wood provides a great setting for conducting casual meetings or simply socializing in an open, inviting environment. The larger than typical guest rooms feature new carpet, wall paper, lighting, curtains, updated bathrooms, and paint schemes. Conveniently located in the heart of Williamsburg, the refreshed Fairfield Inn and Suites Williamsburg provides warm, inviting, and spacious accommodations for both the business traveler and leisure travelers with families. It is only minutes away from major attractions such as Busch Gardens, Williamsburg Outlets, the College of William and Mary, Colonial Williamsburg, and all of the dining and shopping options in the area. Guests can connect to free WiFi supported by a speedy fiber optic internet connection, and there are ample electrical outlets throughout the lobby to power digital devices. The newly installed community tables provide great team work spaces and group dining seating. "LTD’s Development Division provided purchasing, storing, staging, vendor management, and installation services for this renovation," said Desai. He added, "the renovation was a significant investment by the hotel’s ownership and a commitment to the viability of the surrounding Williamsburg market." LTD’s Development Division has completed over $800 million of hospitality and mixed use projects. For more information, please visit http://www.ltdhospitality.com. Please contact Neel Desai at 757-420-0900 ext. 2 for development service related inquiries.